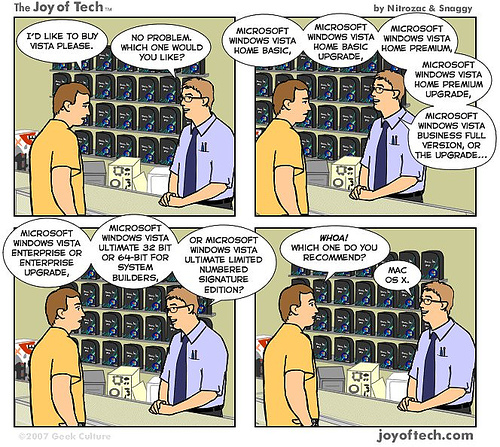 Is your computer “Vista Capable”? If you are one of the unfortunate ones that needed to upgrade your computer this year, and you didn’t get a Mac, you may have been sold a “Vista Capable” machine. It turns out that the majority of basic computers on the market could only run the most rudimentary version of Vista, and as one Microsoft executive states, you may have an expensive e-mail machine. Some folks aren’t happy, feel ripped off, and are suing the Redmond company. And if you fly a lot, you may want to know that George W Bush, and the US Govt are asking European countries to sign an agreement to release a bunch if personal information over to them, and even on non-travellers and family members. I am quite happy that I don’t have to fly down there too often. It won’t be long before you have to leave DNA with them, or have them put a beacon on your ankle to keep tabs on you. When was the last time you read 1984? Seems that they are getting closer to the Orwell novel all the time. And finally, I always have a knackering to learn new things. It has cost me hundreds of dollars taking courses! Well, I am going to save you some money today. If you are interesting in learning about biology, here is a great website with FREE powerpoint presentations on many topics. Next PostNext Happy Darwin Day! !